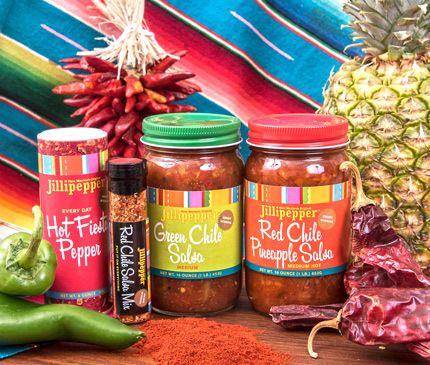 Born in the kitchen of Jillipepper founder and owner Jill Levin in the summer of 1993, Jillipepper's unique, and original New Mexico salsas, seasonings, and mixes all began when Jill's garden produced an abundance of ingredients and she began making fresh salsas. Now, 25 years later, Jillipepper is produced in small batches in Santa Fe full of New Mexico love and warmth. She wondered what she was going to do with all the tomatoes, and since she loves to cook, Jill started making salsa for all her friends. Taking it to parties, potlucks, and events. The reviews were great and the requests for more poured in. Jill's salsas were such a hit that she thought, "Why not bottle it?" Unique Southwest Flavors for the World! Determined to share her salsa with the world Jillipepper was founded in 1993 and incorporated in 1994, going strong for 25 years. The result is Jillipepper Red Chile Pineapple Salsa, Green Chile Salsa, Red Chile Salsa Mix, and Hot Fiesta Pepper. All Jillipepper products are certified "New Mexico True".